Located at the southern end of Topsail Island and accessible only through Surf City, Topsail Beach offers its approximately 500 year-round residents a quiet beach lifestyle uninterrupted by the hustle and bustle of commercialization. High rise developments are forbidden on Topsail Beach, allowing residents and vacationers to fully appreciate the area's surrounding beauty. Searching for your Topsail Beach dream home? You're in luck! We feature all available Topsail Beach homes for sale in the MLS with the most current pricing, photos and property information available. 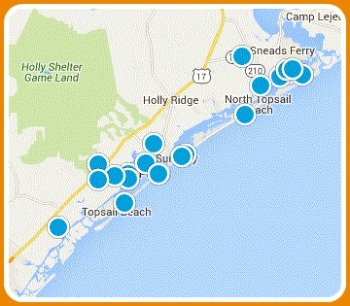 You'll also find Topsail Beach condos, waterfront properties, new construction and foreclosures for sale. Selling a Topsail Beach home? Find out what your Topsail Beach home is worth with a personalized property value assessment. Questions? Want to see a home in person? Contact us! Be the first to see new Topsail Beach homes as soon as they hit the market!